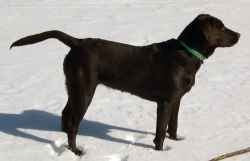 The Labrador Retriever (Labrador or Lab for short), one of the most familiar breeds of dog, is noted for its friendliness, intelligence and obedience. Because of these traits, they are often trained to be assistance dogs, such as service dogs or guide dogs. Labrador Retrievers are the most popular breed of dog (by registered ownership) in both the United States and United Kingdom. Labradors are relatively large, energetic dogs, and they are either black, yellow, or brown in colour, in that order of frequency. The color is determined by two sets of genes; one determining coat color (black and yellow) and the other determining nose color (black and pink/brown). The black coat gene is dominant in both cases. Chocolate Labs are the result of a black coat color gene and a pink/brown nose color gene. Yellow Labs are sometimes known as "Golden Labs", because of their white, light gold, or dark gold colour. Their fur is usually fairly short and straight, and the tail quite broad and strong. Labradors are a well-balanced breed, adaptable to a wide range of functions as well as making very good pets. Labradors were bred in the United Kingdom in the mid-1800s as hunting dogs from dogs imported from Labrador and Newfoundland. As the name suggests, they are excellent at retrieving game, such as ducks, after the game has been shot. Their coat repels water to some extent, thus the extensive use of the dog in waterfowl hunting.